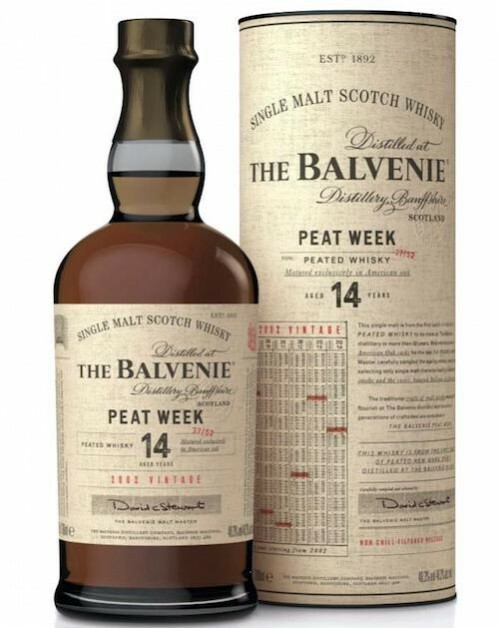 Balvenie Peat Week Aged 14 Year Old Single Malt Whisky is one of the first expressions from the revered Speyside distillery made from 100% peated barley. This expression is the result of a series of trials carried out by David Stewart MBE. It gets its name from the fact that for one week every year, the good people of Balvenie have a "Peat Week" and produce whisky out with their usual scope. This edition has been fully matured in American Oak casks. Nose: Peat latterly, preceded by fruit notes and almonds. Palate: Vanilla, floral senses, peach and honey; soft peat smoke. Finish: Long with a lingering smokiness.